Once you have scheduled your volunteers onto a service, you can then email them to notify that they have been scheduled on. This email will also ask them to approve or decline their scheduled positions. 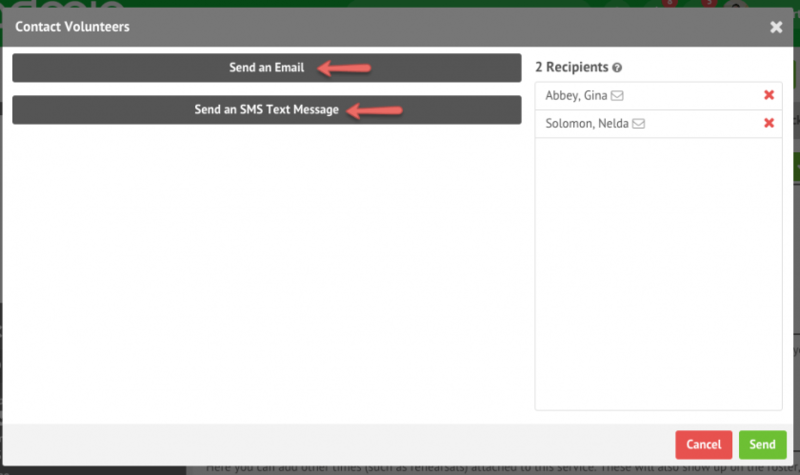 You can choose to email or SMS volunteers using this feature. Simply view the service and click a ‘Contact Volunteer’ button at the top right hand side of the page. You can also choose to contact volunteers within specific departments using the buttons provided. A window will appear, and you’ll be given some filter criteria to use to get a list of volunteers to contact. Simply select the filters that you want to generate your list of people. Once the page loads, then you’ll have the option of sending either an email or SMS to your volunteers. If you choose to send an email, you can choose from a predefined email template, choose to send from an email address, customize the subject and content of the email, and add in any attachments from the files area. Ensure that you have the proper SMS settings configured in your system in order to send SMS in your account. Here you’re able to send to people with a mobile number only, scheduled the SMS to send on a predefined date, or add custom placeholders that are assigned to specific Tithe.ly ChMS fields.